Mix the flour with water and salt using an electric mixer. Form a sphere, powder it with flower and wrap it in foil. Put it in the fridge for 2 hours. Cut the top of the sphere in 4 and make 4 petals that are then stretch with the rolling pin in such a way that you shape a square from the dough. Stretch also the butter with the rolling pin until has 1 cm in hight and shape it in a square. 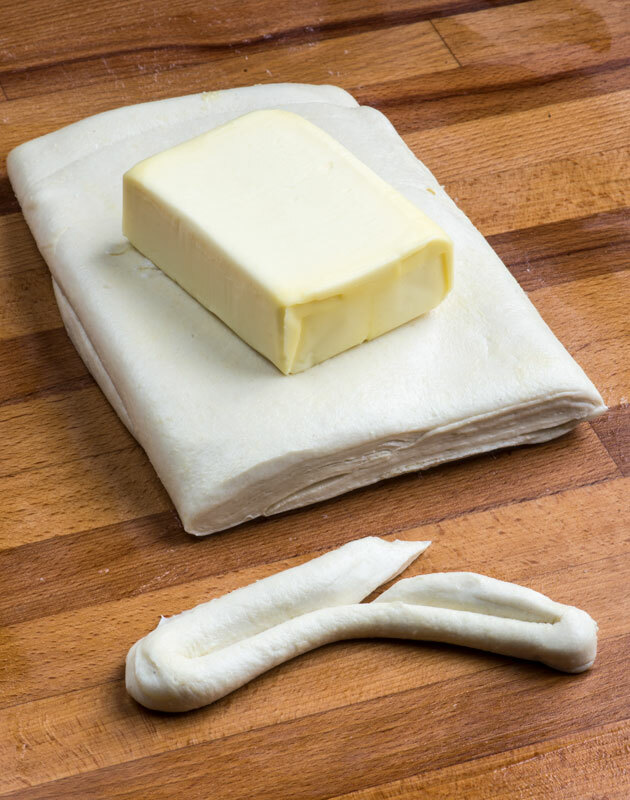 Pack the butter into the dough by placing the butter in the center of the dough with a 45º turn and then take the corners of the dough and bring them back to the center. Stretch the dough making a long rectangle and fold it in 3 on the long side. Turn the dough 90º and make again a long rectangle that you fold again in 3. Pack the dough into foil and put it in the fridge for at least 1 hour. I usually let it over night. Repeat the same steps of stretching and folding in 3 twice again. Let it cool in the fridge for 30 minutes before using it. Because these steps are more difficult to explain than to be done, the most easiest is to follow the instructions in this video, from which I have inspired myself as well.